������ Songkhla, one of Thailand's important ports and coastal provinces, is located 950 kilometers from Bangkok. Klong Hoi Khong 43 kms. From Bangkok: take Highway 4 passing Prachuap Khiri Khan, Chumphon, Surat Thani, Nakhon Si Thammarat,Trang and Phatthalung Provinces in order to reach Songkhla Province. The total distance is 950 kilometers. From Bangkok: There are daily buses from Bangkok to Songkhla and Hat Yai. The journey takes about 13 hours. For the current schedule and further information contact the Southern Bus Terminal at tel: 02 435 1199-200 or visit www.transport.co.th. For Hat Yai, call the Transport Co., Ltd. (Bo Kho So) at tel: 074 23 2789, 0 7423 2404, Piya Tour 0 7442 8972, Thai Doen Rot 0 7442 9525. From Hat Yai Bus Terminal, there are buses to Bangkok and other provinces in the south. Buses depart from a small bus station located across the ferry station in the city. They include daily 2nd class buses that depart for Bangkok 4 times a day (437 baht). There is also one VIP bus that runs directly to Bangkok departing at 4.45 p.m. with a fare of 870 baht. In addition, first-class buses leave for Bangkok twice daily (562 baht) in late afternoon and in the evening. In addition, there are also buses depart from the same terminal to Chumphon (245 baht), Nakhon Si Thammarat (100 baht) and Surat Thani (150 baht). Pho Thong Transportation Co., Ltd. (tel. 0 7431 1126) provides bus services from Songkhla to Hat Yai. Minivans and share taxis normally leave from Ramwithi Road for Hat Yai at the rate of approximately 20-30 baht/person. Minivans depart from the southern part of Sisuda Road to Pattani and Yala at the rate of 70 baht. Ranot Transportation Co., Ltd. (tel. 0 7431 1523) operates buses from Songkhla to Nakhon Si Thammarat. Air Asia operates several daily flights on route Bangkok Hat Yai. The flight time is 1.20 hours. Visit www.airasia.com to reserve your seat online, or simply call 02 5159999 for more information. Orient Thai provides three daily flights connecting Bangkok and Hat Yai. The flight time is 1.25 hours. Call 1126 to make reservations or visit www.onetwo-go.com to make online reservations. Nok Air operates three daily flights between Bangkok and Hat Yai. The flight time is 1.30 hours. Call 1318 for reservations or visit www.nokair.com to purchase an e-ticket. Phuket Air offers a daily flight connecting Hat Yai and Phuket. The flight time is 1.25 hours. Call 02 679 8999 for reservations or visit www.phuketairlines.com for more information. Songthaews around the city would cost 10 baht / trip. Motorcycle taxis around town cost between 10 baht and 20 baht (daytime). There are several guesthouses in town that provide bicycle and motorcycle rental services at the rate of approximately 100 baht / day and 200 baht / day respectively. In the late afternoon before sunset, the people of Hat Yai as well as tourists will gather on the road and celebrate the Songkran Festival together. Features a wonderful parade and various kinds of entertainments. This temple was the seat of Somdet Pha Kho or Luang Pho Thuat Yiap Nam Tha-le Chuet, the most revered monk in the south. It is said that one day, a pirate ship sailed along the coast and saw Somdet Pha Kho who seemed different from other people walking in the area. The pirates wanted identify the difference so they docked and kidnapped him. However, the ship did not sail very far before it stopped for no apparent reason and had to anchor there for several days until they ran out of freshwater. Somdet Pha Kho took pity on them so he put his left foot in the sea, making it sparkle and turn into freshwater. The pirates became faithful, asked for his pardon, and took him ashore. From then on the people started to pay homage to the monk. The temple is located at Mu 6, Tambon Chumphon, on Khao Phatthasing, about 48 kilometers from Songkhla, on the Songkhla-Sathing Phra Highway. Getting there: From the city take highway 407 pass Tinnasulanon Bridge and then turn to highway 408 (Songkhla-Ranot) about km. 110. This is a magnificent temple to visit particularly for archeology enthusiasts. Established in 999, the temple has several ancient ruins from the Srivijaya Period such as Chedi Phra Maha That, Wihan Phra Phutthasaiyat (reclining Buddha), and the bell tower. The monastery is located at Mu 4, Tambon Cha Thing Phra, just 200 meters from the District Office. Established as a wildlife refuge on 19 April 1976, the park occupies an area of 227,916 rais (91,166 acres) in both Songkhla and Phatthalung Provinces. In fact this Park is part of Tha-le Sap Songkhla or Songkhla Lake. The survey taken by the Royal Forestry Department discovered 44 families, 137 genus, and 219 species of birds. The best times to view the birds are from December to March. Boats are provided by the park office at 150 baht an hour. This Park is situated at Mu 4, Tambon Khu Khut, about 55 kilometers from Songkhla, on Highway 4083 and three kilometers from the highway into the park. For more information please call the Park Office at Tel. 0 7439 7042. This Park, covered with verdant forests, is where two magnificent waterfalls namely Ton Dat Fa and Ton Lat Fa are located. There are two routes to the park: from Amphoe Sadao the distance is 26 kilometers or from Amphoe Na Thawi on the Na Thawi-Ban Prakop Road with a distance of 31 kilometers. The admission is 100 baht for adults and 50 baht for children. For more information, please call Amphoe Na Thawi Office at 074 371010. This Tunnel is situated in Khao Nam Khang, Mu 1, Tambon Khlong Kwang, approximately 4 kilometers from the Park Office. Once known as the Piyamit Village 5, the tunnel was operated by Communist insurgents. After almost 40 years of fighting with the Thai Government, the Communist Party was dispersed and became part of Thai Development Participants in 1987. Thailands largest and longest man-made tunnel, it was completed in two years with three separate corridors and three levels deep. The tunnel itself could accommodate about 200 persons with several rooms such as conference room, sick bay, radio transmission room, kitchen, firing range, etc. Located on Sai Buri Road, this large temple is perhaps the most important Buddhist temple in Songkhla. It is said that Yai Si Chan, a Songkhla millionaire donated a large sum of money to construct this more than 400 years old temple. Later on Wat Liap was built to the north and Wat Pho to the south. The local residents then changed the name of the temple from Wat Yai Si Chan to Wat Khlang or Wat Matchimawat. This temple also has the Phattharasin Museum that houses various artifacts collected from Songkhla, Sathing Phra, Ranot, and other places. The bridge, which is the longest concrete bridge in Thailand, spans Songkhla Lake and is part of Highway 408. The bridge has two parts with the first part connecting the coast of Amphoe Muang Songkhla at Ban Nam Krachai to the southern coast of Ko Yo for a total distance of 1,140 meters. The second part connects the northern shore of Ko Yo to the coast of Ban Khao Khiao for a total distance of 1,800 meters. It was opened to traffic on 25 September 1986. Located on Chana Road, the Museum, constructed in the Chinese style, was originally built in 1878 as the mansion of Songkhla's ruler. It later became the domicile of Songkhla's upper administrative officers, the City Hall and in 1953, the building was converted into a museum to exhibit lower southern artifacts. Today it is the place where local archaeology, history and folk art and culture can be studied and appreciated. Noteworthy is the collection of artifacts of the Na Songkhla Family that used to rule the city. It is opened to the public, from 9 a.m. to 12 p.m. and 1 p.m. to 4 p.m., except Mondays, Tuesdays and public holidays. Located on Chana Road, the Museum, constructed in the Chinese style, was originally built in 1878 as the mansion of Songkhla’s ruler. It later became the domicile of Songkhla’s upper administrative officers, the City Hall and in 1953, the building was converted into a museum to exhibit lower southern artifacts. Today it is the place where local archaeology, history and folk art and culture can be studied and appreciated. Noteworthy is the collection of artifacts of the Na Songkhla Family that used to rule the city. It is opened to the public, from 9 a.m. to 12 p.m. and 1 p.m. to 4 p.m., except Mondays, Tuesdays and public holidays. This Institute is situated on Ko Yo, near the foot of the second part of the Tinsulanond Bridge. Established in 1978 to undertake the study of southern arts and culture, the institute has been transformed into a live museum that exhibits comprehensive sets of local art and culture, and southern lifestyles. The systematic exhibitions cover more than 30 rooms with displays concerning history, religion, tradition, occupation, folk play, handicrafts, and various artifacts. In addition, there are presentations that recount local wisdom, which has been accumulated and passed down through several generations. Other than the exhibitions and presentation, there are several viewpoints where visitors can admire Songkhla Lake and aquaculture farms in the institute. Admission fee is 50 baht. Call 0 7433 1185-8 for more information. Located on Nang Ngam Road, the pillar, which is highly revered by the local residents, was constructed when the city was built. This area of the city has distinctly Chinese characteristics as can be seen in the Chinese-style building where the pillar is enshrined and nearby buildings on Nakhon Nai and Nakhon Nok Roads. The distinctive Chinese lifestyle and influence in the area is due to the presence of Chinese immigrants, who came to settle in Songkhla at the beginning of the 24th Buddhist Century and had a major role in the establishment of Songkhla. Located on the Songkhla-Chana Highway, Tambon Khao Rup Chang, this open- zoo was established with an aim to preserve Thai wildlife. When they are ready, the wildlife will be returned to the wild. The zoo occupies a hilly area with an asphalt ring road. Various animals which have been grouped separately, such camels, birds, red gaur, tigers, crocodiles, etc., are major residents here. One of the highlights in the zoo that should not to be missed is the scenic viewpoint overlooking the whole city of Songkhla. Food stalls are available. For more information please call 074 325037-8. This lake is the largest lake in Thailand covering an area of approximately 80 kilometers long and 20 to 25 kilometers wide in Songkhla and Phatthalung Provinces. In addition, it is the only natural, fresh-water lake in Thailand. Several islands across from its mouth namely, Ko Yai, Ko Si, Ko Ha, Ko Kaeo, Ko Mak, Ko Rai, and Ko Yo are worth visiting for relaxation. Boat services are available for touring the lake. The port behind the post office or the fresh market has all-day long-tailed boat services. Located on Chana Road near the Songkhla National Museum, Phathammarong Museum is a Thai-style museum constructed to resemble the birthplace of H.E. Prem Tinsulanond, the former Prime Minister and Statesman who is a Songkhla native. It is open daily except on Monday at 8.30-16.00 hrs. A peninsula situated to the northwest of Laem Samila that is naturally shaded with sea pines. At the end of the peninsula is the statue of Prince Chumphon Khet Udomsak, 28th son of King Rama V and founder of the Royal Thai Navy. The best view of Ko Nu and Songkhla Lake can be spotted from here. Located in the City Municipality, about 2.5 kilometers from the fresh market (Thalat Supsin or Thalat Sot Thetsaban), the peninsula is renowned for its powdery sandy beach, shady pine groves, and the statue of a mermaid Songkhla's most famous landmark. It is easily accessible via Hat Yai-Songkhla buses. From the city, visitors can take a minibus directly to the beach. A small island in the Songkhla Lake that has recently become an important tourist attraction in Songkhla. Covering an area of 9,275 rais (3,710 acres), the island is accessible via the Tinsulanond Bridge. Geographically, the islands coastal plain is suitable for agriculture such as a special kind of jackfruit called Jampada. Another famous island product is its hand-woven fabric. Another charming attraction located at Laem Samila is Khao Tang Kuan. This is the location of the famous Sala Vihan Daeng, the royal pavilion built during the reign of King Rama V. An additional attraction is a hill-top Dvaravati chedi housing the Lord Buddha's relics that was built during the Nakhon Si Thammarat Empire. From this hilltop, visitors can admire a panoramic view of the city and the Songkhla Lake. Every October, there is a festival to drape the chedi with a cloth and to offer alms to monks who descend to the foot of the mountain to receive alms. In addition, monks travelling by boat from other temples in Songkhla would proceed along the waterfront so that the local residents can offer alms and pull their boats, which is considered highly merited. Approximately three kilometers to the south of the famous Hat Samila is Kao Seng fishing village, which has one of the most beautiful beaches in Songkhla. Along the coastline are several pieces of rocks, one of which stands out above the cliff. The local residents refer to that rock as "Hua Nai Raeng". Kao Seng is a corruption of the name derived from the Thai word "Kao Saen", referring to the nine hundred thousand bahts treasure that is buried under Hua Nai Raeng. Kao Seng can be reached via the road to the National Coastal Aquaculture Institute. The hill-top house overlooking the Tinsulanond Bridge that connects Ko Yo was built in 1991 and was completed in 1996. Surrounded by coconut plantations, the compound was built by local residents to honor H.E. Prem Tinsulanond, the Privy Councilor and Statesman, when he was Prime Minister. H.E. Prem graciously returned the house to the people of Songkhla. Located on Phetkasem Road, near Khlong U Taphao Bridge, the monastery is where Phra Phuttha Hattha Mongkhon, a large reclining Buddha measuring 35 meters long, 15 meters tall, and 10 meters wide, is enshrined. Highly revered by both Thai and foreign tourists, the image is believed to be the third largest reclining Buddha in the world. Located in the Ton Nga Chang Wildlife Sanctuary, about 26 kilometers from the city, this 7-tiered waterfall is one of the beautiful waterfalls of the south. The waterfall offers scenic views, with the third level being the most beautiful as the stream is separated into two, resembling the elephants' tusks. Trekking trails are provided for tourists with adventurous hearts. To reach the waterfall by car, follow the Hat Yai-Rattaphum Road for 13 kilometers, then turn left at Ban Hu Rae and proceed for another 13 kilometers. Alternatively, a tuk-tuk can be hired to take visitors to the waterfall for two to three hours at between 300 baht to 400 baht. On the other hand, visitors can also take the minibus from the fresh market (Talat Sot Thet Sa Ban Hat Yai). The park is located on Kanchanawanit Road and is approximately six kilometers from the city center on the Hat Yai-Songkhla Highway. A popular recreational spot for the local residents, the park is beautifully decorated with colorful flowers. With a pavilion in the middle of the pond, an aviary, and food stalls, the park is the perfect place to spend a peaceful evening. Additional attractions include a statue of King Rama V that is enshrined at the foot of the hill near the aviary, a hill-top Brahman shrine and a jade statue of Guan-yin, the Chinese Goddess situated, at the southern foothill near the boy-scout camp. This Chedi was built by Phraya Si Phiphat (That Bunnak) and Somdet Chao Phraya Maha Phichaiyat to commemorate the victory over Sai Buri, Pattani, Penang, and Malayan Revolts. After the victory, Phraya Si Phipat remained in Songkhla for two years and built this Chedi to accompany the first one, before he returned to Bangkok. It was built by Chao Phraya Phra Khlang (Dit Bunnak) and Somdet Chao Phraya Borom Maha Phrayurawong to commemorate the victory over the Sai Buri Revolt in 1830. The Chedi is situated at the top Khao Daeng, Tambon Khao Daeng. This community can be dated back to the early Southern period when most of the inhabitants were seafaring merchants who traded with the Chinese and Indians. Situated 500 meters from the Gulf of Thailand and 3,500 meters from Songkhla Lake, the community left its ancient ruins made from brick and stone, as well as Chinese pottery from the Tung dynasty (618-908) and Yuan dynasty (1279-1368). From town district take highway 408 for 36 kilometers. Namtok Boriphat Forestry Park is about 52 kilometers from Amphoe Muang Songkhla. To get to this small all-season waterfall, drive along Highway 406, at the kilometer 35 and 36 marker, switch to use a dirt road and proceed for about one kilometer. Wat Chai Mongkhon, on Phetmongkhon-Chaimongkhon Road, has a chedi that was built to house the Buddhist relics brought back from Langka by a monk named Na Issaro who was teaching Pali there in 1892. The Fortress was constructed during the reign of King Rama III, when the city was established. Today, the Fortress, which is located behind the Songkhla Provincial Police Headquarters, stands as a timeless proof of Songkhla's rich heritage. 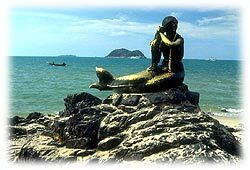 Perhaps the most well-known symbol of Songkhla province, both islands are located off the shore of Laem Samila. According to the legend, a dog, a cat, and a mouse, traveling on a Chinese sampan stole the merchant's magic crystal and tried unsuccessfully to swim ashore and drowned. The mouse and cat became the islands in the Songkhla Lake while the dog died on the shore and became the hill called Hin Khao Tang Kuan near the bay. Totally destroyed, the crystal then became the white sandy beach called Hat Sai Kaeo which literally means crystal sand beach. Located in proximity to Laem Samila, this small hill has a hiking path that wind up to the top where the statue of Prince Lop Buri Ramet (The Southern Viceroy) is situated. There is a viewpoint where it is possible to enjoy a panoramic view of the city. On the northeast is Suan Seri (Seri Park), a nicely landscaped park decorated with ornamental plants in animal shapes. Tamnak Khao Noi, on the south, was built in 1911 as the residence of Prince Lop Buri Ramet and was used by Their Majesties the King and Queen on a visit to the south in March 1959. Today the mansion is the residence of the Songkhla Provincial Governor. Hat Yai, which is situated approximately 28 kilometers from the city of Songkhla, is an important gateway to Malaysia and Singapore. Strategically located only 60 kilometers from the port of entry at Sadao, Hat Yai has only recently been developed and has rapidly been transformed into the commercial, transportation, communication, educational, and tourism hub of the south. Tourists enjoy shopping at Hat Yai for various goods ranging from fresh produce to consumer products such as electrical appliances. The area of Niphat Uthit 1, 2, or 3 Roads is where major commercial shops are located. Several shopping centers available include Lido Shopping Center, Odeon Shopping Center, Sanehanuson, Hat Yai Plaza Shopping Center, and Si Kimyong Market on Phetkasem Road. วัดมัชฌิมาวาส หรือวัดกลาง อยู่ที่ถนนไทรบุรี อำเภอเมืองสงขลา เป็นวัดใหญ่และสำคัญที่สุดในจังหวัดสงขลา อายุ 400 ปี สร้างตอนปลายอยุธยา เดิมเรียกว่าวัดยายศรีจันทร์ กล่าวกันว่ายายศรีจันทร์ คหบดีผู้มั่งคั่งในเมืองสงขลาได้อุทิศเงินสร้างขึ้น ต่อมามีผู้สร้างวัดเลียบ ทางทิศเหนือ และวัดโพธิ์ ทางทิศใต้ ชาวสงขลาจึงเรียกวัดยายศรีจันทร์ว่า “วัดกลาง” และได้เปลี่ยนชื่อเป็น “วัดมัชฌิมาวาส” โดยพระเจ้าน้องยาเธอกรมหมื่นวชิรญาณวโรรสคราวเสด็จเมืองสงขลาเมื่อ พ.ศ. 2431 ในวัดมีโบราณสถานที่น่าสนใจหลายแห่ง อาทิ พระอุโบสถ สร้างสมัยรัชกาลที่ 1 เป็นศิลปะประยุกต์ไทย-จีน ภายในมีภาพจิตรกรรมฝาผนังที่ยังอยู่ในสภาพสมบูรณ์ เช่น ภาพท่าเรือสงขลาที่หัวเขาแดงที่มีการค้าขายกันคึกคัก ซุ้มประตู เป็นศิลปะจีนกับยุโรป และมีพิพิธภัณฑ์ “ภัทรศิลป” เป็นที่เก็บพระพุทธรูป วัตถุโบราณ ซึ่งรวบรวมมาจากเมืองสงขลา สทิงพระ ระโนด ซึ่งเป็นหลักฐานที่สำคัญทางประวัติศาสตร์ควรค่าแก่การศึกษา เปิดให้เข้าชมทุกวัน เว้นวันจันทร์-อังคารและวันหยุดราชการ เวลา 13.00 - 16.00 น.